Thank you to everyone that applied to become an ambassador – we are now making our decision and will respond to applicants as soon as possible. We hope you all have a very Merry Christmas and a Happy New Year! 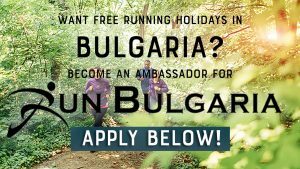 We are excited to announce our Run Bulgaria Ambassador Programme. This programme gives you opportunities like no other! FREE Run Bulgaria Run Camp including Flights, Accommodation and Transfers. YES THAT’S RIGHT! You get to join us completely FREE at one of our Running Camps held in Bulgaria. Run Bulgaria branded exclusive Ambassador Cap. Expert training advice from elite athletes and qualified professional running coaches. You spread the word about Run Bulgaria, Our Holidays and Our Training Camps. You actively promote our running holidays and camps throughout Social Media, In your community, blogs and running clubs, online and offline. You help us design the best experiences and camps for our guests. We are excited for you to join us.